Note: I’m no AD expert, there are better, worse, and different ways to do this and you’re not required to use VirtualBox. Download the necessary software. Download the ISOs for the OSes you’ll be installing. 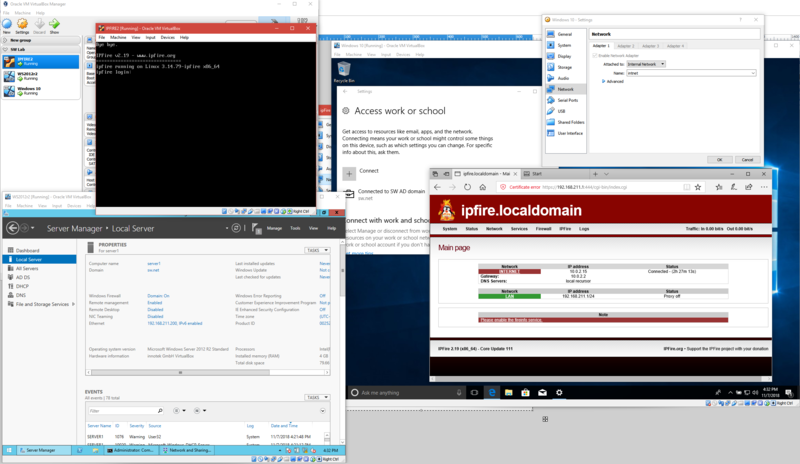 For this example, I’ll be using IPFire and MSDN versions of Windows Server 2012R2 and Windows 10 Pro. Change the OS to Linux, Ubuntu 64bit is fine as the version. Click Next. Enter 512MB for memory. Click Next. Click Create for a new virtual HDD and select VDI. Click Next. Select Dynamically allocated and click Next. Change the location here if necessary. The 10GB default is large enough, click Create. Once created, click Settings and then click Network. We need to modify the networking options. Adapter 1 should be set to NAT or Bridged. Click Settings on the IPFire VM. Click Storage. Click “Empty” next to the CD icon. Click the CD icon next to the far right to mount the ISO. 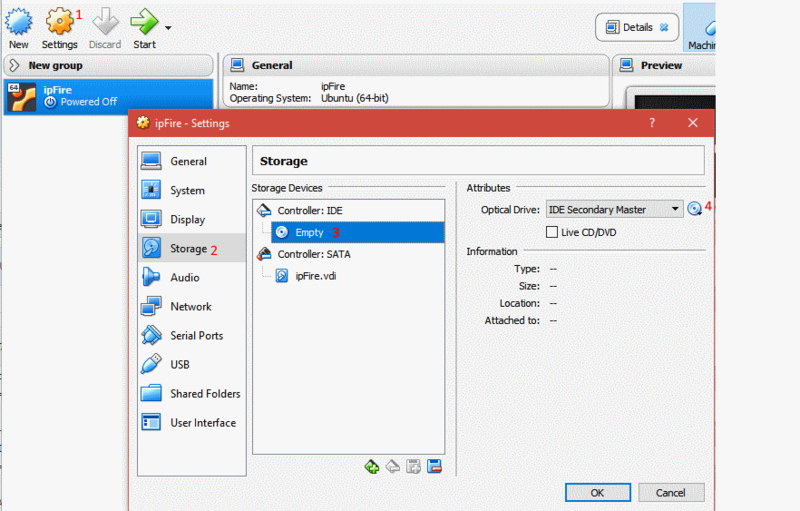 Select “choose a virtual optical disk file” and browse to the ISO’s location. Select to mount. Click Ok to close the window. Follow the IPFire prompts. Press enter to select, tab to move between selections, and the space bar to select check boxes. All defaults can be used. Select the keyboard mapping. I’m using “us.” Press Enter to accept. Set your timezone. By pressing the first letter of your timezone, you can jump to that section. Select the correct timezone via the arrow keys and press Enter to accept. Enter a host name, the default is fine for our lab. Press Enter twice. The default domain is fine for our lab, press Enter twice to continue. Enter the root password and press Enter each time and once more to continue. Arrow down to “drivers and card assignments.” and press Enter. Green: This is our internal network. Press Enter to select. Compare the MAC and select the correct interface. Press Enter to select the Interface. Red: This is our internet facing network, NAT or Bridged. Select RED, press Enter, and press Enter again to select the remaining interface. 1. Select GREEN and press Enter. 2. This is a new private, virtual network for our lab. Select a different IP subnet than your host network to avoid confusion. 3. The IP warning can be ignored as we are not logged in remotely. In this example, the subnet is 192.168.211.1/24. Since this will be the gateway, we can use 192.168.211.1. The subnet mask does not need to change. 4. Press Enter until you return to the GREEN/RED menu. 1. Select RED and press Enter. 2. Select DHCP. This interface will get the IP from the VBox NAT or your physical network’s DHCP server. You can modify the hostname here if necessary. 3. Tab to Done and press Enter. We will be using Windows DHCP instead of IPFire’s. Tab to OK and press enter without enabling DHCP. Press Enter to close setup. From the VBox main men, click New. Enter a name, ex: “WS2012R2”, select the appropriate type (Windows 2012) and version (64-bit). Click Next. Set RAM to 4096MB. If you have more than 16GB of RAM, you can increase to 6 or 8GB, if needed. Click Next. Create a new virtual hard disk, click Create. Select VDI and click Next. Select Dynamically allocated, and click Next. Enter 80GB and click Create. Click Settings, then click Network. Select Storage. Click the CD under storage devices, then click the CD icon to the left of Optical Drive. Select Choose virtual optical disk file. Browse and select your Windows Server ISO. Install Windows as you normally would. Enter the IP information. The IP needs to be on the same subnet as configured for the GREEN network. EX: 192.168.211.200, GW: 192.168.211.1, DNS: 127.0.0.1 since we’ll be creating a domain controller with DNS and DHCP services. You should be able to ping an IP address, but not a DNS name. 2. Follow the wizard’s steps. 3. Promote: Add a new forest. 4. Enter your domain name and follow the wizard. –you will get a warning about DNS, this will be resolved later. DNS. We need to add a forwarder for our DNS settings. 2. Right-click on your server and click Properties. 4. Click Edit, and add your external DNS servers like 4.2.2.1, 4.2.2.2, 8.8.8.8, and 8.8.4.4. 2. Expand IPv4 and right-click, click New Scope from the menu. 4. The remaining settings can be default for now. 5. When asked to configure scop options, verify “Yes” and click Next. 8. WINS does not need to be configured at this time. 9.When prompted to activate scope, verify “Yes” and click Next. 10. Click Finish to complete the wizard. 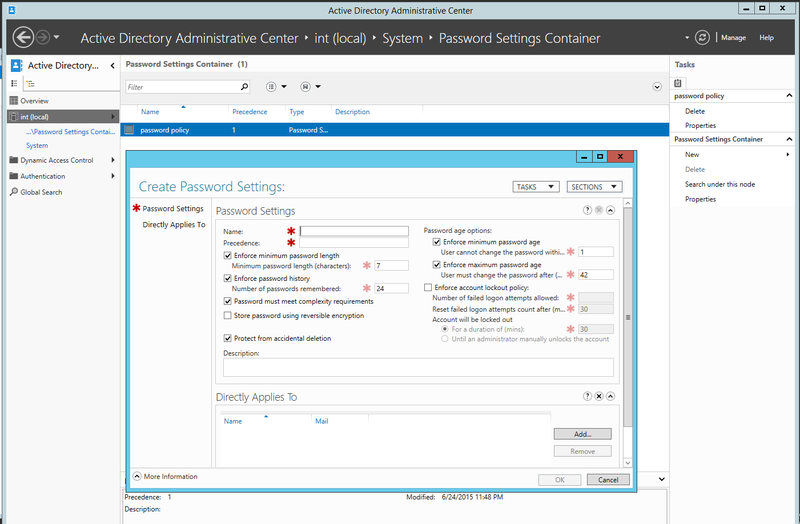 Right-click on the server’s name under DHCP, and click Authorize from the menu. Refresh and IPv4 should have a green circle with a white check mark. You can access IPFire’s management console via a web browser. Use “admin” and the password entered during step 4. Note: You will get a certificate error when accessing the IPFire management page. 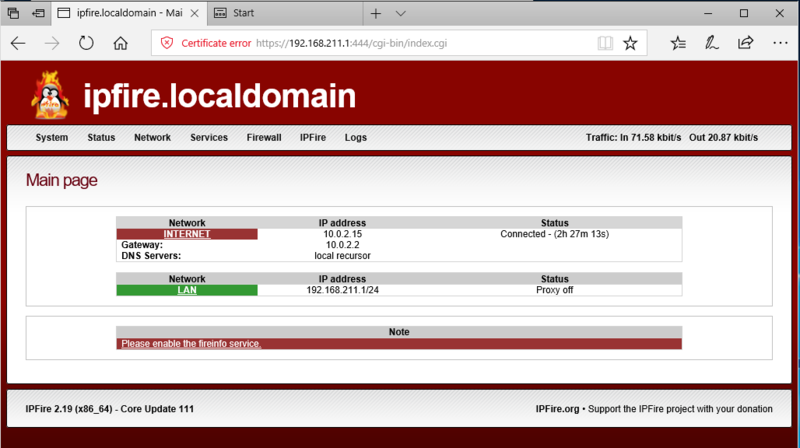 -Win10 VM – joined to sw.net, displaying IPFire’s web management page and network settings. Here’s a quick way to get rid of the “public” network on Windows and switch it to a more usable private network type. Get the list of network profiles on the system. Note the InterfaceIndex number listed, you’ll need it for the final step. Change the network interface to private, use the network interface index number from the previous command. Change the Policy Security Settings you want. Here’s the window, note that I’ve already created a password policy. A new forest/domain will not have anything populated in it. I don’t recommend disabling all these settings if you’re in a production environment. Integration services do not require a separate installation because they are built-in. Datacenter, Enterprise, Standard and Web editions. Install the integration services after you set up the operating system in the virtual machine. Datacenter, Enterprise, Standard and Web editions. Upgrade the integration services after you set up the operating system in the virtual machine. Datacenter, Enterprise, Standard and Web editions (32-bit and 64-bit). Install the integration services after you set up the operating system in the virtual machine. Edition information is not applicable. Install the integration services after you set up the operating system in the virtual machine. ***Essentials edition – 2. Standard edition – 4. Essentials and Standard editions. Install the integration services after you set up the operating system in the virtual machine. Standard, Web, Enterprise, and Datacenter editions (32-bit and 64-bit). Install the integration services after you set up the operating system in the virtual machine. Download and install Linux Integration Services Version 3.4 for Hyper-V. Integration services are built-in and do not require a separate download and installation. Ultimate, Enterprise, and Professional editions (32-bit and 64-bit). Upgrade the integration services after you set up the operating system in the virtual machine. Business, Enterprise, and Ultimate, including N and KN editions. Install the integration services after you set up the operating system in the virtual machine. Professional. Install the integration services after you set up the operating system in the virtual machine. SUSE Linux Enterprise Server 11 SP2 64 Integration services do not require a separate installation because they are built-in. Open SUSE 12.1 64 Integration services do not require a separate installation because they are built-in. Ubuntu 12.04 64 Integration services do not require a separate installation because they are built-in. While not exactly hot off the presses (updated 2012Oct23) it is not super visible. Windows Server 2012 64 Integration services do not require a separate installation because they are built-in. Windows Server 2008 R2 with Service Pack 1 (SP 1) 64 Datacenter, Enterprise, Standard and Web editions. Install the integration services after you set up the operating system in the virtual machine. Windows Server 2008 R2 64 Datacenter, Enterprise, Standard and Web editions. Upgrade the integration services after you set up the operating system in the virtual machine. Windows Server 2008 with Service Pack 2 (SP 2) 8 Datacenter, Enterprise, Standard and Web editions (32-bit and 64-bit). Install the integration services after you set up the operating system in the virtual machine. Windows Home Server 2011 4 Edition information is not applicable. Install the integration services after you set up the operating system in the virtual machine. Windows Small Business Server 2011 Essentials ed. – 2Standard ed. – 4 Essentials and Standard editions. Install the integration services after you set up the operating system in the virtual machine. Windows Server 2003 R2 with Service Pack 2 (SP2) 2 Standard, Web, Enterprise, and Datacenter editions (32-bit and 64-bit). Install the integration services after you set up the operating system in the virtual machine. Windows Server 2003 with Service Pack 2 2 Standard, Web, Enterprise, and Datacenter editions (32-bit and 64-bit). Install the integration services after you set up the operating system in the virtual machine. CentOS 5.7 and 5.8 64 Download and install Linux Integration Services Version 3.4 for Hyper-V.
CentOS 6.0 – 6.3 64 Download and install Linux Integration Services Version 3.4 for Hyper-V.
Red Hat Enterprise Linux 5.7 and 5.8 64 Download and install Linux Integration Services Version 3.4 for Hyper-V.
Red Hat Enterprise Linux 6.0 – 6.3 64 Download and install Linux Integration Services Version 3.4 for Hyper-V.
Open SUSE 12.1 64 Integration services are built-in and do not require a separate download and installation. Ubuntu 12.04 64 Integration services are built-in and do not require a separate download and installation. Windows 8 32 Integration services do not require a separate installation because they are built-in. Windows 7 with Service Pack 1 (SP 1) 4 Ultimate, Enterprise, and Professional editions (32-bit and 64-bit). Upgrade the integration services after you set up the operating system in the virtual machine. Windows 7 4 Ultimate, Enterprise, and Professional editions (32-bit and 64-bit). Upgrade the integration services after you set up the operating system in the virtual machine. Windows Vista with Service Pack 2 (SP2) 2 Business, Enterprise, and Ultimate, including N and KN editions. Install the integration services after you set up the operating system in the virtual machine. Windows XP with Service Pack 3 (SP3) 2 Professional. Install the integration services after you set up the operating system in the virtual machine. Windows XP x64 Edition with Service Pack 2 (SP 2) 2 Professional. Install the integration services after you set up the operating system in the virtual machine.